Baquet tells the CBS This Morning crew why he won't release the tapes. 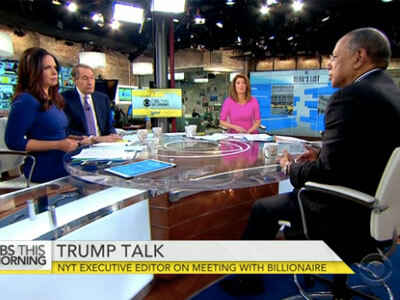 New York Times executive editor Dean Baquet appeared today on CBS This Morning, days after BuzzFeed EIC Ben Smith broke a story about the substance, as it were, of a meeting between Donald Trump and The New York Times’ editorial board. According to Smith’s sources, the off the record portion of the conversation revealed that Trump isn’t as militant on his anti-immigration position as he plays in public. Baquet isn’t part of the board, but ended up at the meeting because Trump is a siren no one can resist and we’re still waiting for someone to play the part of Odysseus and ask to be restrained in order to avoid Siren Trump’s lure. “We assume they came from somebody at the Times?” Rose interjects, asking about the source of the leak. Rose tries to get Baquet to talk about whether or not Trump’s wall talk is real or for show. This distinction is in some ways important, but in others almost irrelevant, considering the levels of xenophobic vitriol that stance has encouraged. “That’s the point,” says Rose, referring to the importance of determining Trump’s true stance. “That would be Andy Rosenthal’s call,” replies Baquet. There’s certainly one Trump-related wall that seems impossible to construct: the one that separates what is farce and entertainment from legitimate coverage of an American election. With Trump, everything is a show, but the consequences do not remain contained to a television set.